Preschool Sticker Activity Book | Multicolour | Prepare your children for the early school years with this fun sticker activity book. Prepare your tiny tots for their early years at school with this fun do-it-yourself activity book. Featuring a range of interactive and entertaining activities such as drawing, colouring, writing and much more, this activity book helps preschoolers develop basic skills of word recognition, formation and vocabulary. 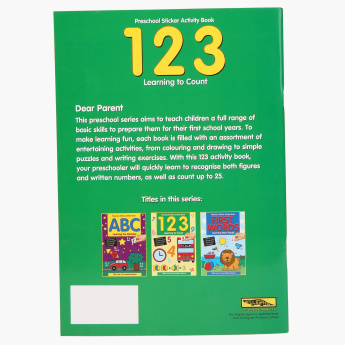 Feature 2 : The book contains a range of interactive and entertaining activities, such as drawing, coloring, writing, puzzles and over 50 stickers. 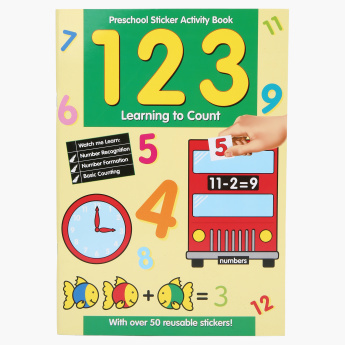 Feature 1 : Prepare your children for the early school years with this fun sticker activity book. Feature 3 : Helps preschoolers develop basic skills of word recognition and formation, spelling and vocabulary.